WE were told not to expect much and for once, England did not disappoint. Roy Hodgson’s hastily assembled class of 2012 weren’t particularly bad in their Group D opener in Donetsk, but in the interests of honesty it must be accepted that they weren’t especially good either. It was a point won for England but not a point proven – and the prevailing feeling remains that qualification from a tricky group would represent an achievement for this lightly fancied squad. When Joleon Lescott applied a firm header to Steven Gerrard’s wonderfully flighted free-kick, England briefly looked like a team ready to surpass the low expectations that have accompanied them this summer. By the time distinctly ordinary Italian referee Nicola Rizzoli had blown the final whistle, it felt like we had pitched our ambitions just about right, for this is an England team that is in transition and with little to shout about. From a purely selfish perspective, North East observers might be cursing the contribution of the excellent Mathieu Debuchy. Newcastle had been hoping to conclude a deal for the Lille right-back in advance of Euro 2012 but his advisers counseled Yohan Cabaye’s best friend to wait until after the tournament had finished – a move that might just scupper United’s hopes of signing him. The defender was the game’s class act, causing no lesser figure than Ashley Cole some genuine headaches with his prompting down the right flank. It was the kind of eye-catching display that will cause Alan Pardew – who told the Journal he had his “fingers crossed” for an English win – some anxiety. On this initial evidence, it is difficult to discern whether either side will be heading home before the knock out stages. Both looked tentative and perhaps a little afraid of the danger the other posed and both seemed satisfied with the outcome. That hardly speaks of the confidence of champions. At least Hodgson’s side were exactly as we expected – doughty, direct and difficult to break down. In Gerrard they had the most honest of captains and in goal, Joe Hart continues to advance the case that he is the best England ‘keeper since Peter Shilton. But after flashes of inspiration, the jury remains out on tyros like Alex Oxlade-Chamberlain and Ashley Young – who showed promise but were ultimately undermined by anonymous second half showings. Somewhat surprisingly, France were also light on the sort of inspiration that wins tournaments and struggled with the poser that was presented to them by these least-heralded of Three Lions. If Laurent Blanc’s side were your tournament dark horses, you might wake up this morning with the fear that Les Bleus look suspiciously like one-trick ponies. A glance at the two team sheets suggested that they possessed all of the flair and creativity but England nullified them for much of an uninspiring hour and a half. The much-vaunted Franck Ribery threatened without producing much of a cutting edge while Karim Benzema’s exquisite club form was not transformed to the international stage. 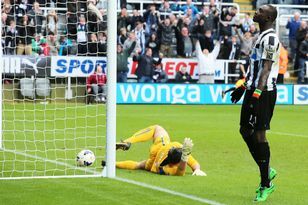 Instead it was left to Cabaye – so often the artisan on Tyneside this season – to brush French efforts with a touch of class. On two occasions in the first half he produced the sort of breath-taking passes that we have delighted at in the season just gone, but both were wasted by profligate forwards. All but the most blinkered in the North East would have been rooting for England – but you couldn’t help but feel vindicated by the contribution of Cabaye. All season we have marvelled at his ingenuity and passing range and here he was proving on the biggest international stage that Newcastle possess arguably their classiest central midfielder since Rob Lee diligently directed matters from the engine room. And England? They were encouraging enough in spells but dropped off markedly in a second half in which they sat very, very deep. Hodgson came to Eastern Europe with a plan and after picking a team including the attacking brio of Oxlade-Chamberlain, it seemed to be working for much of an error-strewn first half. England broke with speed and purpose and Danny Welbeck belied his relative lack of international experience with a performance of maturity and promise. At times it looked like Ashley Young would provide the support he sorely needed but his tendency to get caught off-side by an ordinary French defence was troubling – and Hodgson had more than enough reason to curse Wayne Rooney’s two-match ban. Midfield was another mixed bag. Gerrard was terrific, stretching the pitch with some brilliant balls but also putting in a shuddering defensive shift. But Scott Parker gave the ball away too much and James Milner was below par. At least we can rely on the defensive solidity that had been so remarked upon in the build up to the tournament. Hart was excellent – there was certainly nothing he could do about Nasri’s excellent leveller – and Lescott and John Terry formed a good partnership. Questions remain for Hodgson ahead of Friday’s meeting with Sweden but one thing is certain: England will have to improve to progress. ENGLAND boss Roy Hodgson insisted his side remained a work in progress after their draw with France last night. FROM the Football Association’s safe pair of hands, the safest of squads.